D.M. BrownsThe most destuctive fire in the history of Dundee is that which raged in the Seagate and Trades Lane on Thursday night and Friday morning. The locality has an appaling fire record but great as were the previous outbreaks these have been completely eclipsed by the latest disaster. For more than 12 hours the fire raged with terrible intensity and the country was lit up for miles around. As a spectacle it was magnificent, but the appalling loss of capitol involved invested it with more than ordinary melancholy. All through the night the scene of the outbreak was besieged with crowds of citizens drawn by curiosity to witness what will live in memory as a night of flame. 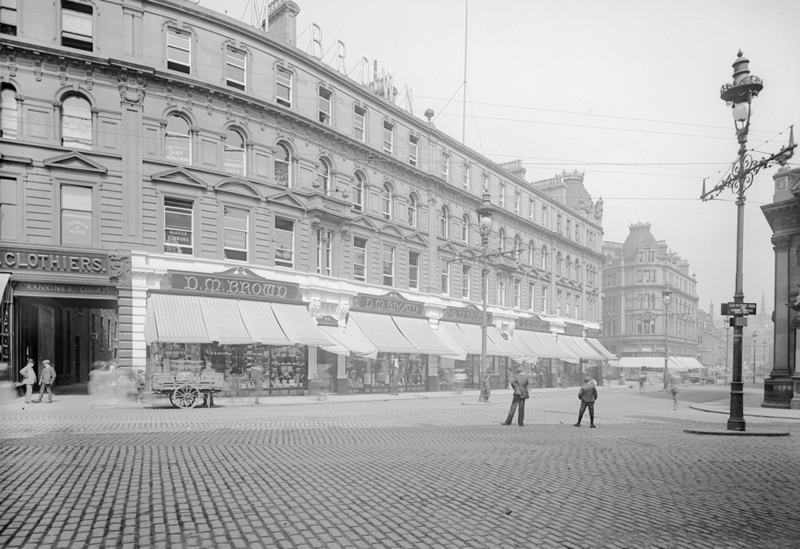 The fire originated in the bonded stores of Messrs James Watson & Co., Ltd Distillers. This popular house of entertainment is making great headway among the music-loving classes of the city, and rightly so, for the programmes presented are of the best. This week the three sprightly Florodora Girls, Annie, May and Ivy have charmed large audiences twice nightly with their cheerful vivacity, clever dancing and sweet singing. They are not strangers to the city by any manner of means and the success which always attends their efforts proves the genuine character of their show. Wanted:- Montrose Burgh School, Male (certificated) assistant teacher to commence duties on the 20th August next. Salary commencing at the rate of £100 and rising by annual increments of £5 to £120 per annum. Application with five copies of testimonials to be lodged as early as possible with, William Ross, Clerk to the Board, Montrose by 6th July 1906. Mains and Strathmartine Horticultural and Sports Society. The annual Flower Show will be held in the Public School, Downfield on Saturday 4th August 1906. Grand Programme, walking match, horse trotting. Blairgowrie Brass Band will be in attendance. Excursions to London, West of England, South Coast, Liverpool, Manchester, Birmingham, Blackpool and Windermere in the summer months. Inclusive rates for holidays in Blackpool. Also conducted Continental tours. Apply Flemings & Haxton, 76, High Street, Dundee. For the purpose of allowing final adjustments to be made, a trial run took place over the new Arbroath Road tramway on Monday afternoon and proved highly successful. The car, on board of which were Convener Speed, Mr Pete Fisher, the Manager, Mr Thomson, interim Burgh Engineer, Mr James Mackison and Mr Charles Lamb, under whose supervision the overhead equipment has been fitted and Mr J.H. 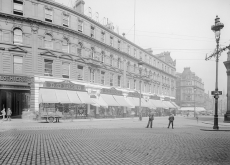 Shepherd, Manager of the Dundee, Broughty Ferry and District Tramways, left the High Street at 3.30pm and made excellent progress, both the outward and inward journeys being accomplished without a hitch. The route is not quite finished, but everything will be in readiness for the official inspection on Monday first. Everybody says "Splendid Have you been to see it? The window displays are lovely"
Incidentally, there are quite a number of special bargains to commemorate the opening at different counters, and a hint is just as good as a bookful of directions, is it not? Mr H.E Loseby's Red Alsation Band performs from 3pm to 5pm and again from 7pm to 9pm. D.M Brown, 80, High Street, Dundee. Midwifery and Ladies Nursing - a thorough training at moderate terms is given at the General Nursing Association, 27 Scotia Street, St George's Cross, Glasgow. N.B: These classes qualify for the C.M.B examination. The holiday time in Dundee is a favourite time for young people changing their state, and next week nearly 150 weddings will take place in the city. During the past week the notice-boards at the various registrars' offices have been well filled with intimations of intended nuptial celebrations, while in the city churches tomorrow there will be the usual long list of proclamations. Several of the ceremonies have been fixed for Wednesday evening of next week, but the larger portion of them are arranged for the eve of the holidays - Friday. The total of holiday weddings this year is a good average and only one or two less than it was a year ago. The number of marriages registered in the city during the last six months however, shows a marked increase when compared with last year, the figures being:- 1906 - 668; 1905 - 631 an increase in favour of this year by 57.